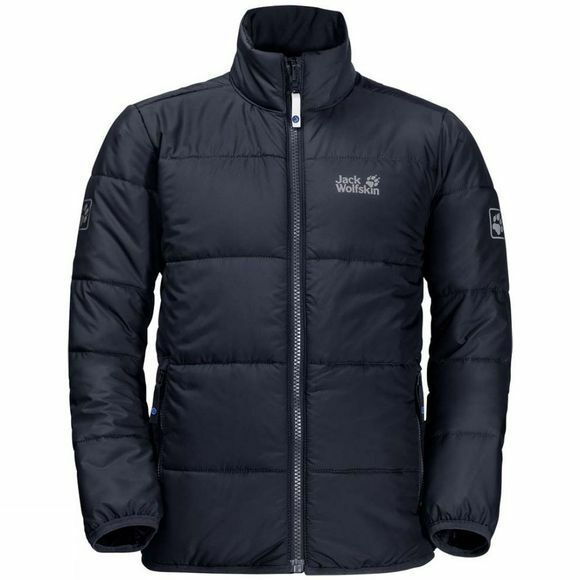 If your boys prefer to be outdoors, even in the winter months, you should take a closer look at the KOKKOLA JACKET. This winter jacket provides the protection your child needs in cold, breezy and showery weather and is equally suitable for wear in the hills or the adventure playground. We made this jacket from extra lightweight materials to ensure unimpaired freedom of movement. The KOKKOLA teams a wind and water resistant SOFTTOUCH TAFFETA outer fabric with functional MICROGUARD ECOSPHERE insulation made from recycled synthetic fibres. This eco-friendly insulation material is extremely warm and it retains its thermal performance even if it gets damp. In heavy rain or very windy conditions, the KOKKOLA can be zipped into a compatible shell jacket. With its eye-catching pawprint on the back, this is what the cool kids will be wearing this winter!